Last week I attended Stampin' Up! OnStage Live event in Orlando, Florida. One of the great perks of attending a Onstage event is swapping and it's so much fun. There's two kinds of swapping events: general and organized. In the past I've participated in the general swapping but this year I signed up for three organized swaps, Thanksgiving/Fall, 3-D and Sympathy. I wanted to create a 3-d project that would remind the recipient of this great event. 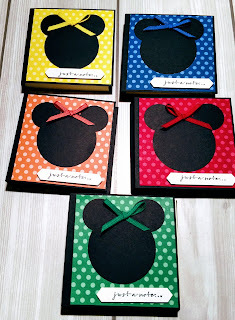 So I decided to create Minnie Mouse post-it note holders. I really had a great time creating these cute post-it note holders. Measurements: 3 1/4" x 7"
Cut black card stock 3 1/4" x 7", score at 3 1/4" & 3 3/4"
Cut Designer Series Paper 3 1/6" piece. Punch (1) 2" circle and (2) 3/4" circle using the black card stock. Stamp sentiment on whisper white cardstock and cut using the classical label punch. Attach DSP to card base using snail adhesive. 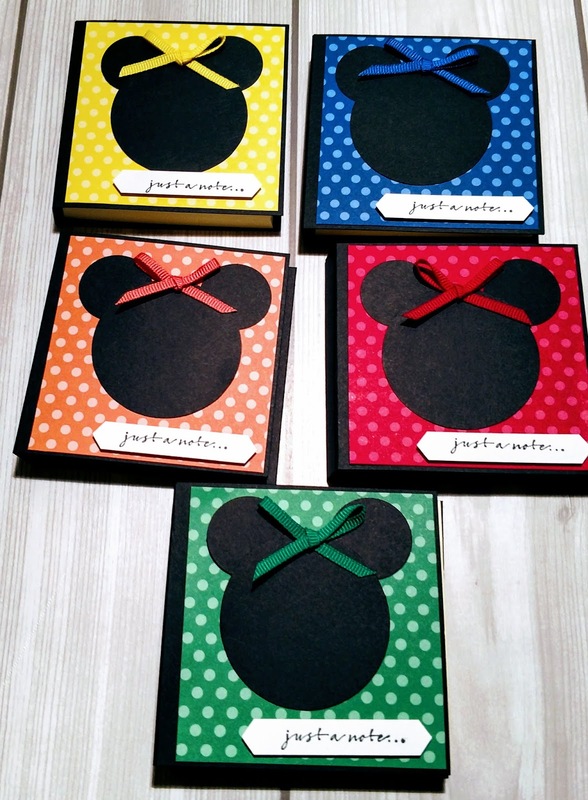 Assemble circles to create Minnie Mouse silhouette and attach to card base. Make bow and attach to holder as shown in the picture. Attach sentiment label using mini dimensionals. Use the tear and tape adhesive to secure post-it note to the holder. All the materials for this project can be purchased in my Online Store. Spend a minimum of $40.00 and receive a spool of the in-color ribbon of your choice. Sign up for my newsletter and get 10% off of one item in my OnlineStore!